Nice 3 bedroom ready for new owners to call it home! !Freshly painted stucco exterior, covered porch overlooks private wooded yard w/plenty of yard for kids to play in! Large dining area off kitchen, can fit the whole family for holiday feasts! Kitchen is fully equipped w/stainless steel appliances to include built-in micro & fridge; granite counters and bar top & pantry closet.Gathering room is huge with plenty of space for big screen! There is a flex room (no closet) that could be used as 4th bedroom/office. Otherwise, secondary bedrooms are good sized along with master bedroom w/walk-in closet & en suite bathroom. Both full bathrooms have double sinks for convenience; inside laundry room includes w/d. Knockdown textured ceilings throughout; utility sink plumbing hook up. One year home warranty - 2-10; transferable termite bond - Adjacent to Waterleaf Elementary, community has walkway to school - great for the kiddos & parents. 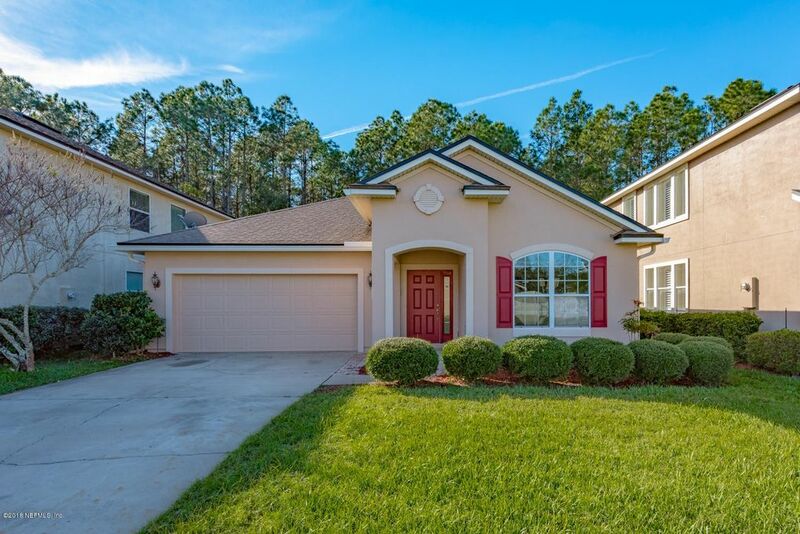 Community is close to shopping, dining, St Johns Town Center, beaches, JIA, downtown, NS Mayport & Blount Island - very centrally located to everything! Community offers nice pool, kids splash park, clubhouse area and attractive entrance into community. Directions: From Atlantic Blvd, head North on Kernan Blvd. Left on Waterleaf Blvd. T/L on Candlebark Dr, house on the right.